The Oxford Lafayette Heritage Foundation held their annual meeting Monday night at the Burns-Belfry Museum and Multi-Cultural Center where they unveiled a new interactive map system displaying the history of Lafayette County and its people. The maps are available online for free and show Lafayette County from a variety of different historical perspectives. The earliest map in the system is an 1835 map of the Chickasaw Nation that once occupied the area. Others maps include current satellite photos, the 1930 census map, United States Geological Survey Maps and more. Each map’s transparency can be adjusted so that the maps can be viewed transposed over each other. Richie Burnette is the president of the foundation. He welcomed everyone to the museum that night. He was standing at the north end of the church with people sitting in rows and rows and rows of chairs in front of him. A large screen hung from the ceiling to be used by the projector so that everyone could see exactly how the map system would work. The Heritage Foundation began a dialog with the university and the city. They wanted to know if this was something that could actually be accomplished. Through months of research and digging through archives, the foundation was able to acquire 250 maps that they wanted to incorporate into the system. Not all of them worked. It was time consuming, figuring out how to make the maps as accessible and user-friendly as possible while still packing in useful or interesting information. There are still 30 or 40 other maps that they hope to add to the system. Jeff Jackson and Charlie Ross co-chair the University of Mississippi’s Slavery Research group. They stood in front of the crowd gathered at Burns-Belfry Monday evening. They said one of things they were most interested in with the map is how things can be contributed to it. People can add photos, records, texts and other things right over the map. It presents the possibility for people to find a property on the map, click on it and read about who lived there, see their face. 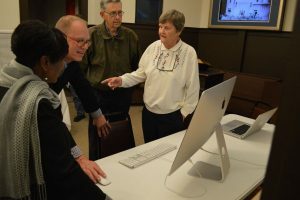 Jackson and Ross spoke about how vital this tool could be in helping to learn more about the thousands of enslaved people who lived, worked and died in Lafayette County. Many of their decedents still call this place home, and have stories, photos and pieces of their lives waiting to be shared with the world. The two men emphasized that they really hope this project will be able to bring back the names and photos of these people, both of which have been lost to time. This history is worth preserving and the names of these people who literally built the built the South, including Lafayette County, are worth preserving, they said. The map is live now on www.burns-belfry.com. On the right side of the screen on the homepage, there is an image of a map with the words “The Historic Maps Project” in bold letters above the photo. Click “Visit Map Site” to go to the maps.